It was really fun to work on something open and lacy in a fine yarn, as this is quite different to the crochet I’m usually doing. I wanted to use a variegated yarn in pretty colours, and have the end result be warm but not bulky. I found this Findley Dappled yarn by Juniper Moon which is a 2ply (laceweight) 50% merino, 50% silk yarn which fit the bill perfectly. This beautiful blue-green-purple colour way is Grapevine (141). It’s a very light and silky yarn, with no stretch and little loft. It has just a slight halo – not the kind of yarn you can easily unravel over large areas! For the pattern, I looked at designs which had an open, lacy structure, but without an overly-elaborate stitch pattern that might fight with the colours. 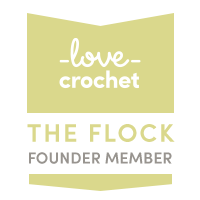 The pattern is easy to follow for an experienced crocheter and allows you to work a scarf the width and length of your choice. Using this combination of yarn and hook meant the crochet would really expand on blocking, so I took this into account when calculating my starting chain. As I explain in my Ravelry project, you need to do a little forward planning of your own to work out how you want the edging shells to fit along the long and short edges. The shells down the long sides of the scarf are staggered, not opposite each other. This means that if you have (n shells) down one side, on the other side you will have (½ shell + n-1 shells + ½ shell). This in turn means that you need to work out how to handle the short edges – either with a shell in one corner and not the other, or fudge it to put a shell in each corner. You decision will also depend on how many repeats you are working across your rows (the length of your foundation chain) and also how tight or loose your edging is in relation to your rows. Be prepared to adjust the number of dtrs (US: trs) in the shells in the edging according to your choice of yarn and hook, to ensure they lie flat. I also added an extra ch before and after the dc (US: sc) between each shell to ensure the edging wasn’t too tight. If I’d realised the lack of symmetry of the pattern before starting, I would have chosen a different pattern, as it bothers me! But I’m sure it will not be noticeable in use in any case, and the overall result soft, drapey and I think very pretty.